If two WFFS carriers are bred together, there is a 25% chance of the resulting foal being affected. A leading sport horse association has decreed that all breeding stallions must undergo genetic testing for Warmblood Fragile Foal Syndrome. The KWPN (Royal Dutch Warmblood Association) in The Netherlands said that three approved stallions have been confirmed as carrying the Warmblood Fragile Foal Syndrome (WFFS) gene. As the name suggests, the syndrome occurs primarily in Warmblood horses. A foal must inherit the mutation from both parents to be affected. Carriers have a mutation in the LH1 gene (also known as PLOD1). It is not known how many others may be carriers, but the company Animal Genetics said the frequency of the mutant LH1 gene in Warmbloods appears to be about 6.40%. 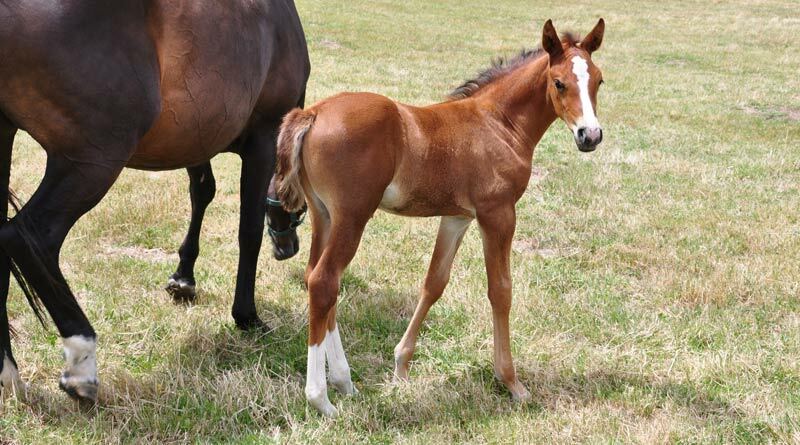 Warmblood Fragile Foal Syndrome (WFFS) is an inherited systemic connective tissue disorder characterized most markedly by a lack of skin tensile strength. In addition to other possible symptoms, this extreme skin fragility results in tearing and ulceration from normal contact with everyday surroundings. WFFS is an autosomal recessive disorder, trait, meaning a foal can be affected only if the foal inherits the disease from both parents. Parents who are carriers do not have any symptoms, but will pass on a copy of the defective gene to their offspring 50% of the time. If two carriers are bred together, there is a 25% chance of the resulting foal being affected and a 50% chance it will be a carrier. Warmblood Fragile Foal Syndrome (WFFS) is an inherited systemic connective tissue disorder. Most fetuses with this disorder are aborted, but if carried to term, no cure is available and the affected foal will die or must be euthanized shortly after birth. The first diagnosed case of WFFS was in Switzerland in 2014, and now this disorder has also been confirmed in at least one warmblood foal in the United States. Tthe board of the KWPN is requiring testing for all active approved stallions of which offspring have been registered in the past five years, as well as any stallions who are undergoing their the performance test. All test results must be provided to the KWPN and will be made publicly available. KWPN North America is following its parent body’s lead and will now require testing for all activated Approved, Licensed and Foalbook stallions. Up to now, KWPN North America has encouraged breeders to voluntarily test their breeding stock. Testing in the US is available through the UC Davis Veterinary Genetics Laboratory and at the University of Kentucky’s Gluck lab. The KWPN-NA said sufficient DNA is usually still available ‘on file’ with UC Davis from a horse’s original hair sample for registration to conduct this additional test. The carrier status of stallions for WFFS will be published on the KWPN-NA website and in the stallion directory. The results of this testing do not affect the status of the stallions with the KWPN breeding program and they will remain as approved or licensed, and will continue to be able to be activated regardless of their carrier status. The KWPN is still discussing how this testing will be integrated in the breeding programme for mares.